After spending several semesters and tens of thousands on college, you finally reached your academic destination: graduation. Your degree is framed and hanging on your bedroom wall. Your cap and gown are hanging cleanly in your closet. Compared with the long days of lectures, homework assignments, and group projects – all while working a part-time job – life after graduation looks like a proverbial walk in the park. Are you ready to manage your money? While earning “adult money” is exciting, you may find yourself facing a learning curve when it’s time to start handling your personal finances. Even as a business school grad myself, I didn’t have the basic financial literacy I need to prepare for my future. While it wasn’t a fun realization, this financial epiphany sparked a sudden interest in understanding and improving my financial situation. Although I was able to catch and correct my financial mistakes, there’s no reason why I couldn’t have started making smarter decisions with my money even sooner. 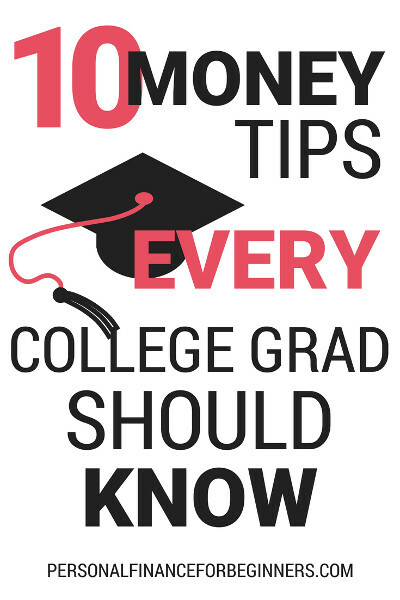 That’s why I’d like to share 10 tips I wish I’d already known when I first graduated from college. If you were fortunate to have a full-time job offer waiting for you after college, how did you feel after receiving your first paycheck? As a new college grad who’s still used to Ramen noodles and dollar menu deals, you may have felt a mixture of excitement and disappointment when the money first hit your checking account. After all, on average college grads earn 50% more money than those with just a high school diploma. If you received an offer for $42,000 in salary each year, don’t assume that you’ll see $3,500 hit your bank account every month. Instead, wait until your first couple paychecks have arrived so you have a better idea of your take-home income. This is the amount that you’ll actually have to work with each month. Don’t assume that you safely spend everything you earn each month and still find yourself prepared financially for the future. Do you know how much you spent on eating out at restaurants last month? To start planning ahead for your financial future – whether that’s paying off your student loans, contributing to a 401k or saving up for a down payment on a house – start by creating a monthly budget that sets aside 10% or more of your income toward “paying yourself” each month. 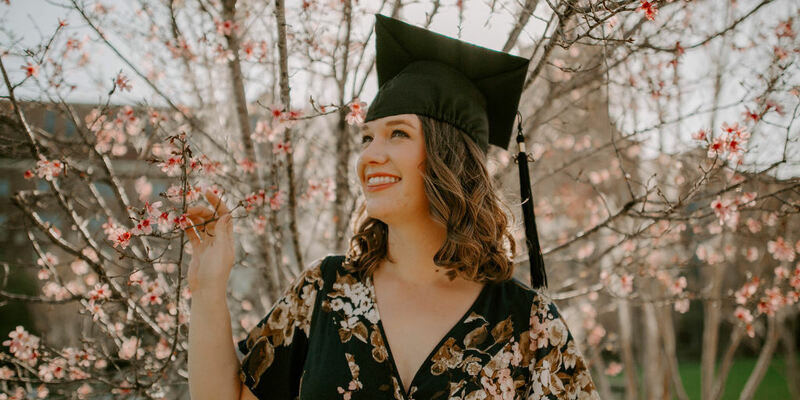 Graduating from college often comes with a significant pay raise, especially if you’re making the jump from a student job to working full-time. Do you have plans to buy a new car or move into a nice apartment of your own as a “reward” for finishing school? You may want to stop and think about how these decisions will impact your finances over the long run. Are you prepared to handle an unexpected financial crisis, such as job loss or medical bills? In the past, you might have relied on the assistance of family members or the convenience of credit cards to make it through difficult times. To become financially independent after college, it’s important to create your own “emergency fund.” This rainy day fund is an easily-accessible (but rarely used) checking or savings account with somewhere between 3-6 months of expenses. This emergency fund is different than short-term savings you might use to pay for a vacation, new laptop, or down payment on a car. Your emergency fund is set aside exclusively to offer you some security and peace of mind should an unplanned, unavoidable, and costly expense come your way. Does setting aside 3-6 months of expenses (often $5,000 to $15,000) sound unreasonable? Even having $1,000 set aside in case of an emergency can offer a huge amount of relief – financially and emotionally. If necessary, start small but make consistent contributions to your emergency fund. Most personal finance experts consider having an emergency fund to be even more important than paying off your debt or saving for retirement. Not paying your balance in full each month. Carrying a balance on your credit cards can cost you thousands of dollars over your lifetime in interest charges – perhaps even more! Don’t let credit card perks like free travel or cash back tempt you into buying things you can’t afford. The value of those benefits can quickly be outweighed by the costs of interest and annual fees. Regardless of your current situation with credit cards, make sure you’ve set up automatic payments to cover at least the minimum required payment each month. It’s far too easy to overlook a payment date and find yourself with a dinged credit score or unnecessary late fee! If you do have credit card balances that you’re carrying from month to month, they paying off this debt will become your #1 priority. Create a reasonable budget that will prevent you from needing to take on additional debt and will allow you to get the balances paid off as quickly as possible. Did you rely on student loans to cover your college tuition and expenses? If so, you’re not alone. Over 44 million Americans are paying an average of $350 each month toward student loan payments. So what’s the best way to handle student loan payments? Believe it or not, the most efficient way to handle student loan debt isn’t necessarily to pay it off as quickly as possible. If any of the above apply to you, it might be better to put your additional money there instead of paying down your student loans (although you should always make the minimum payment!). But if you’ve already built an emergency fund, invested in your retirement accounts up to the employer match, and paid off any credit cards… Wipe out that student loan debt! Up to this point, your credit score may have had minimal impact on your personal life. You may have needed a co-signer if you’ve taken out student loans, but odds are, you have a limited credit history and most of your credit-dependent decisions are still ahead of you. As long as you’re paying your credit card balance in full each month and staying consistent with payments on any additional loans (auto loans, student loans, medical bills, etc. ), your credit score will gradually improve over time. You don’t need a perfect credit score, but reaching (and staying over) 750 is a good target goal to have the best financial options when you need them. 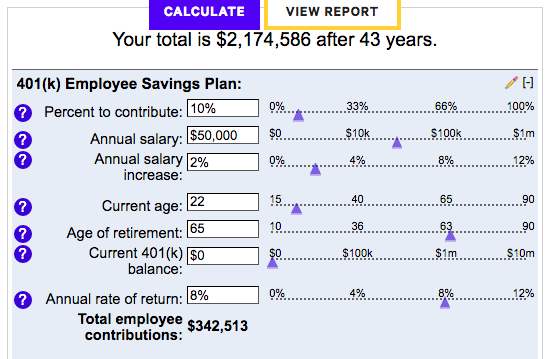 Take a minute to put your numbers into this 401k calculator (or just use the default numbers already given). What’s the biggest factor for boosting your retirement savings? Here’s one example where you start contributing 10% of your income to a 401k right after graduation. By age 65, you’ll likely have over $2 million in your portfolio. But what if you decide to hold off for 10 years before you start investing – how much does it cost to wait? To earn roughly the same amount, you’ll have to contribute 2.3 times as much from each paycheck. 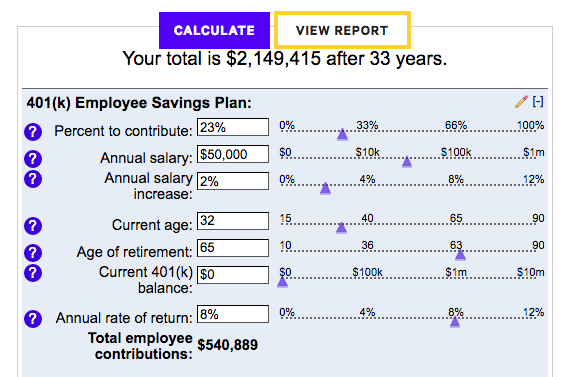 In the first scenario, you contribute $340,000 and the rest is earned through investing. In the second scenario, you have to contribute an additional $200,000 of your own money to make up for lost time. It pays to start early! How does “free money” sound – pretty good, right? You may be leaving exactly that on the table if you’re not taking advantage of any “employer match” offered on your contributions to retirement accounts. This employee perk isn’t offered by every company, so you’ll want to check with your Human Resources team. Sometimes, even if employer matching is offered, there are limits in place, such as a minimum tenure with the company or what percentage your company is willing to contribute. Making the most out of the employer match can sometimes double your retirement contributions instantly! It could take anywhere from 7 to 10 years to double your contributions if you’re relying simply on the market. These days, many companies are creative in the types of extra benefits they offer to attract and retain top talent. Find ways to make the most of what’s offered! Having a college education is quickly becoming the norm for many occupations. If you want to set yourself apart for both financial and career success, you’ll need to continue learning new ideas and developing additional skills. Now I understand, if you’ve spent any of your semesters taking early-morning classes, you might be looking forward to sleeping in now that you’ve graduated. While I won’t blame you, you might want to consider continuing to wake up early each morning to focus on your own personal and career development. After a long day at work, it’s going to be hard to remain motivated and focused after you get home. Be proactive in building a career that fits your skills and interests. Spending just a few hours a week on skill development will quickly set you apart. By implementing these 10 money tips now, you’ll quickly find yourself more financially prepared than many of your peers. Don’t wait until you’re facing a major decision, such as buying your first home or starting a family, to start preparing for the future. Choose one of the tips above and get started today!